Well this is something - an indie film about making an indie film. Shooting Clerks is a fictional feature biopic made by Christopher Downie retelling the story of Kevin Smith making his breakout debut film Clerks in 1994. The film stars Mark Frost as Kevin Smith, Chris Bain as Jason Mewes (who has appeared in other films made by Downie about Mewes), Kit Alexander as Brian O'Halloran, and Tom Sullivan as Jeff Anderson. The cast list also includes a cameo by the real Kevin Smith as Larkin Eve. As expected, this is super low budget and almost like a fan-made retelling of the original story, but it also has enough support to get a release. They'll be showing the film on a small screening tour including a showing in NYC, heading to a few other places like Orlando and New Jersey. Give this a look below if you're curious how it turned out. Shooting Clerks plays in Orlando starting October 22nd, in NYC on November 10th & NJ on November 11th. Shooting Clerks details the true story of how New Jersey convenience store clerk, Kevin Smith made his seminal film and the friends who aided him on his indie crusade. 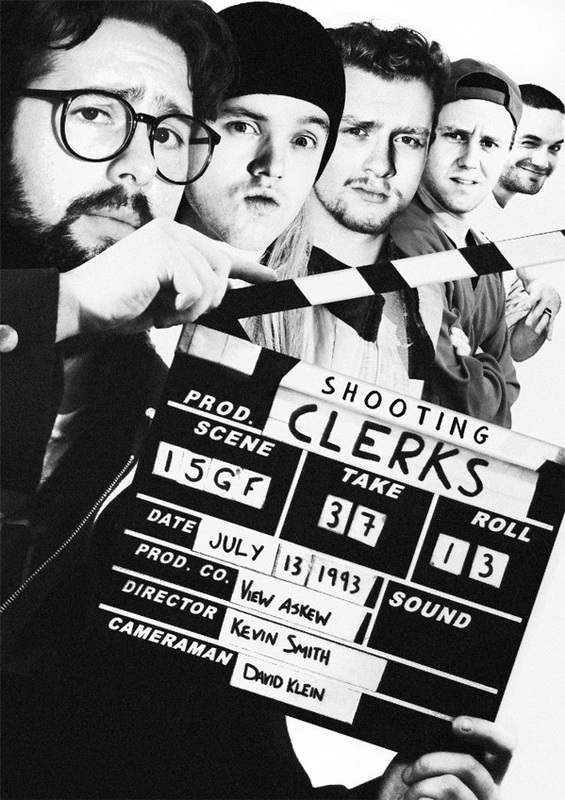 Shooting Clerks is both written and directed by Scottish filmmaker Christopher Downie, who has worked on a number of various projects including other Kevin Smith fictional films and shorts like The Twelve Steps of Jason Mewes: Undercover Lover and "Babble-On Begins". This new film is premiering at screening events specifically, starting in New York and New Jersey. "Every ticket holder will receive a swag bag, filled with exclusive merch as well as the chance to win a set of prototype Shooting Clerks figures." For more info and screening dates coming up in October and November, visit the film's Facebook page or Twitter @UppieDownie. Thought on this one? For it's time it was extremely ground breaking. Pretty close to being as groundbreaking as his contemporary, Q. Tarantino. Time has told us which of these masterminds would become successful. A Kevin Smith biopic? I am eager not to see it.